Everybody would like to become more creative. And yes, sleep (and science!) can help. We know that creative thinking and problem solving often require suppression of preconceptions and restructuring of existing knowledge. In other words, creativity integrates new ways of thinking with older knowledge. Such an integration is thought to be facilitated by sleep. Specifically Slow Wave Sleep (SWS), that has been shown to help us pull general rules out of sets of related information. Also, Rapid Eye Movement (REM) sleep is thought to be important for making inferences and improbably connections. 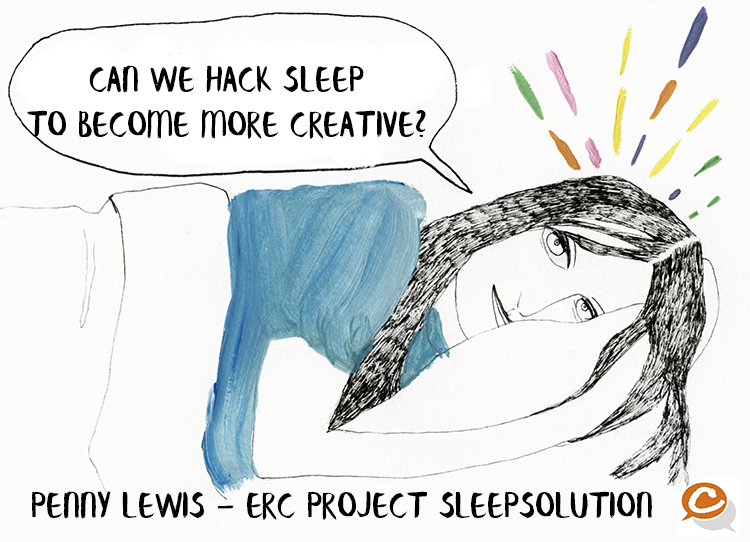 SleepSolution an ERC project led by Penny Lewis (Cardiff University) is investigating how we can manipulate sleep to uncover how REM and SWS sleep promote both long-term memory and creative problem solving. The project is doing this by triggering memory replay in REM and SWS and looking at how this impacts on problem solving. Dr Lewis will also will develop methods for boosting key sleep processes in a selective, targeted manner, to facilitate everyday problem solving.